Every week on the Multiple Listing Service (MLS) you see countless homes that come up “expired”. For those that are not familiar with the term, an expired listing is a home that did not sell. When looking over the possible common denominators of why some homes do not sell the reason is usually pretty easy to spot. In most cases the reason is very simple. The home was improperly priced. In a very competitive Real Estate environment, the price that is set on a home can be more than 75% of the marketing! What the hell do you mean by that Bill? Very easy… if you come on the market at the wrong price, the best Realtor in the country with the most sophisticated marketing will not be able to get a home sold. 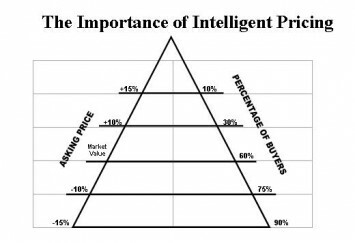 As the graph above shows, the further you get from market value, the percentage of buyers dwindles. So who is to blame when a home comes on the market at the wrong price? Tough question to answer but most of the time the fault lies with the Realtor. How so? The Realtor is the one who does the market evaluation on the property and gives the seller a suggested list price and probable sale price. I know there are some that are probably thinking that is all well and good but on many occasions sellers think their homes are worth more than the suggested value and insist of the home being listed for a higher price. My response would be the Realtor doesn’t have to take the listing! The problem in our industry is that for every overpriced home there was a Realtor who was willing to take it. There are some agents that have the hardest time walking away from potential business. Then there are the Real Estate agents that always tell sellers what they want to hear in order to get the home listed, especially when the agent knows they are in competition with other Realtors. Shocking but true. Buying a listing in this industry has been going on since the 1st Real Estate companies went into business. Tell em what they want to hear, get a signature on the contract and then beat em over the head for price reductions. So unprofessional but it happens a lot! Some agents don’t care because they use a listed home to generate buyer calls which can turn into future business. How do you avoid this? When you are sitting down with Realtors to go over the value of your home you should be getting some kind of appraisal report preferably with pictures that show other like homes that have sold. The homes being compared to yours should look similar. If they don’t a red flag should be going up in your head. Likewise, if the homes do look similar yet the agent is telling you a much higher price for your home there should be a rock solid explanation of why that is the case. Remember fair market value is what other similar homes have sold for. Not what you need or want to sell your property for. Buyers could care less what your perceived needs are. All they care about is paying the right price. Over and over again statistics show that homes priced properly out of the gate sell for more than those who believe a higher list price leads to a higher sale price. As the days on market grows for any property on the market so does the gap between the original list price and final sale price. Ask any buyer which home they feel they have more bargaining power on…the one that has been on the market for 200 days or the one that has been on 20. The second biggest part of the equation to having a successful home sale is picking the right Realtor. Over the years this has been the one thing that really baffles me about the Real Estate business. Selling a home is a huge decision yet on many occasions there is so little effort that goes into picking a Real Estate agent to work with. Unfortunately, some folks mistakenly believe we all do the same thing to sell homes. This could not be further from the truth! Choosing a top producing Realtor should be an important criteria yet it does not always work that way. In most industries when you want a hire someone to do work for you the persons track record and qualifications are of the utmost importance. From what I have witnessed 1st hand, a fair amount of time this does not enter a sellers mind when putting their home on the market. Instead they pick someone they think has a good personality or again tells them something they want to hear. In most industries there is an 80/20 rule where 80% of the business is done by 20% of the people. Most people do not realize that in the Real Estate industry 94% of the business is done by 6% of the agents! While that is mind blowing, it also is easy to see why there can be a lot of disappointment amongst consumers with their agents. So much goes into being a successful Realtor and an entire article could be written about it but some of the important traits you should be looking for are a past track record of success, a powerful marketing plan centered around the internet, excellent communications skills, and brutal honesty. If a Realtor possesses these four traits you are more than likely going to have a very pleasant experience selling your home or condo. Asking some good Real Estate interview questions for Realtors always goes a long way in making better decisions. Other obstacles to a successful home sale include making it difficult for people to get into the home and not presenting the home well. In a competitive market you want your home to shine not stick out like a sore thumb. It is awfully tough to sell homes when they look like the pits and equally as difficult when potential buyers can never get in to view it. About the author: The above Real Estate information on how not to sell a Massachusetts home was provided by Bill Gassett, a Nationally recognized leader in his field. Bill can be reached via email at billgassett@remaxexec.com or by phone at 508-435-5356. Bill has helped people move in and out of many Metrowest towns for the last 24+ Years. Next post Realtor Communication Skills The Number One Complaint! 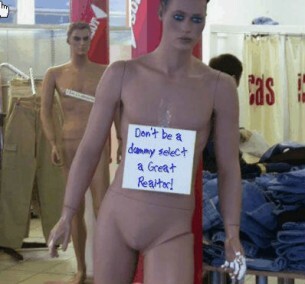 Bill I have to tell you I love your article and the picture of the dummy!! This really made me laugh because of 1st hand experiences I have had myself picking the wrong Realtor for some of the reasons you mention. Believe me I learned the hard way. In the future I know doing my home work will be important. Your interview questions were great. Great article. Sellers often make a lot of mistakes when trying to sell their home, and you’ve done an excellent job of highlighting these mistakes and offering solutions for them.